Please note that only a small part of our inventory is illustrated here. Please contact us for your specific needs. A group of 18th c, Chinese export doll house mini-ature porcelain vases painted in underglaze blue. Circa 1700-1800. Chinese export oval spoon tray painted in underglaze blue. A rare Chinese export plate painted in underglaze blue with a pineapple, sprays of cloves and nutmeg. A Chinese export pierced berry drainer painted in underglaze blue with floral decoration. A pair of Chinese export teabowls and saucers painted in underglaze blue with a central tree and fence surrounded by lotus petals. Chinese export porcelain tea caddy painted in underglaze blue with temple and river scenes. A Chinese export spoon tray in underglaze blue "Nanking" pattern. 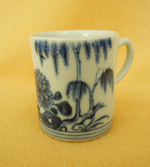 A rare small Chinese export child's mug or miniature tankard painted in uderglaze blue with peoneys and rockery. A Chinese export orange Fitzhugh saucer. Chinese export oval underglaze blue baking dish painted n the Fitzhugh pattern. A Chinese export hot water dish in underglaze blue Fitzhugh. A group of Chinese export porcelain dinner plates painted in underglaze blue in the Fitzhugh pattern. A Chinese export Fitzhugh pattern coffee cup and saucer with elaborate gilding. A group of five Chinese export bread plates painted n underglaze blue in the Fitzhugh pattern. A group of Chinese export porcelain dessert plates painted in underglaze blue in the Fitzhugh pattern. Assembled set of 6 Chinese export coup dishes painted in underglaze blue in the Fitzhugh pattern. Chinese export blue Canton reticulated fruit basket. A large Chinese export blue Canton octagonal platter. A large Chinese export tankard painted in underglaze blue, rouge de fer and gilt in the Chinese Imari taste. A large finely potted ale tankard painted in rouge de fer and gilt with floral decoration. A Chinese export plate painted in underglaze blue, rouge de fer and gilt in the Chinese Imari taste. Kang Hsi period, circa 1700-20.